Xenobiotic compounds are produced in high amounts by many different sources and can be degraded by different microbial species in different environments. However, they often accumulate, thus producing toxic effects in living organisms. Fungi represent the most abundant biomass in soils. Unique features of fungi include the capability to disperse hyphae through soil to support the growth of other microorganisms, a resistance to high concentrations of pollutants, and the capacity to remove pollutants by physical adsorption and/or intra- and extracellular enzymatic mechanisms. 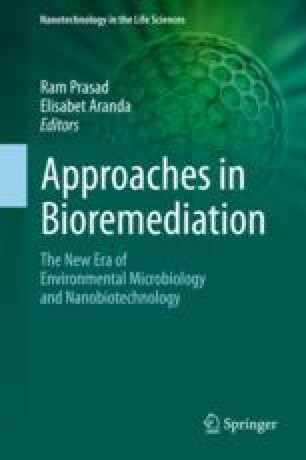 These characteristics serve to make fungi promising microorganisms for in situ and ex situ bioremediation of xenobiotic compounds. The latest advances in genetic engineering by the use of CRISPR/Cas9 technology based on the expression of Cas9 endonuclease and the design of guide RNA molecules allow the editing of specific regions of the receptor genome. In the context of bioremediation, by applying novel genetic engineering techniques, CRISPR/Cas9 could represent a powerful tool for the modification and advancement of xenobiotic metabolism in fungi. This opens a hitherto largely unexploited technology for biological treatment of xenobiotic compounds. HPS acknowledges the Fulbright Program (PS00247479) for the Open Study/Research Grant. RNP was funded by Ramón y Cajal program (RYC-2011-08653). EA gratefully thanks the Ministry of Economy and Competitiveness (MINECO) and FEDER funds for co-funding the Ramón y Cajal contract (RYC-2013-12481).